CreditRepair.com is the leading name in credit repair. Creditrepair.com partners directly with all three credit bureaus, so they can accurately evaluate and recommend credit solutions for your situation. Previous CreditRepair.com members have seen an average 40 point TransUnion score increase in 4 months of membership. Although they were founded in 1997, CreditRepair.com began offering their credit repair services in 2011 and has assisted hundreds of thousands of members since then. CreditRepair.com pulls your credit reports from the three major bureaus (TransUnion, Equifax, and Experian) to identify and dispute unverifiable items such as bankruptcies, charge-offs, late payments, collections, judgments, and more. Past CreditRepair.com clients have seen an average removal of 11.6 negative items across their three reports, as well as an average of 7% of questionable negative credit report items removed monthly. You are also provided with a comprehensive online client portal and a free app on Android or iOS in order to track your progress 24/7. CreditRepair.com offers TransUnion credit monitoring, score tracking, and analysis at no additional cost to you. 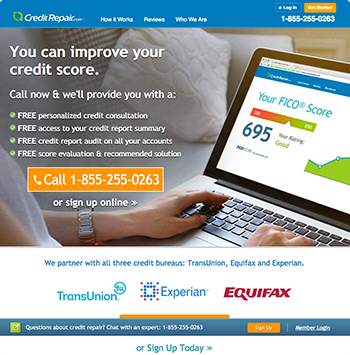 First-time callers to CreditRepair.com also receive a free personalized credit consultation, access to credit report summary, a free credit report audit on all accounts, and free score evaluation. Innovative technology: CreditRepair.com provides you with a personal online dashboard and an Android or iOS app to keep you updated on the progress of negative credit item removals in real time. Free 15-minute credit analysis: Simply call CreditRepair.com for a complimentary 15-minute no-obligation credit analysis to learn if your credit score can benefit from removing negative items. Wide range of removable items: CreditRepair.com can help you work to remove unfair and inaccurate bankruptcies, late payments, repossessions, hard inquiries, collections, judgments, and charge-offs. Fast and legal removals: Each case is unique, but you may see initial results in 30 to 60 days and extensive results in an average of 4 months. CreditRepair.com's credit restoration plans are priced slightly higher than some of their competitors ($99.95/month). In the case that no items are removed, they do not have a money back guarantee. CreditRepair.com charges one of the lowest setup fees in the industry -- only $14.99 to pull your credit reports. Additionally, they also provide extra services like TransUnion credit monitoring, score tracking, and analysis. After a free consultation, CreditRepair.com charges a $14.99 setup fee and a monthly fee of $99.95. This provides unlimited disputes, TransUnion credit monitoring, score tracking, and analysis. You may also sign up with a friend or family member with CreditRepair.com's couples one-time discount of $100, which saves each person $50 on their first payment. How does CreditRepair.com compare to its competitors? CreditRepair.com has an online account and an iOS or Android app in which clients can view progress in real time. Additionally, they provide their members with TransUnion credit monitoring, score tracking, and analysis. What are the call hours for CreditRepair.com? CreditRepair.com's call center can be contacted Monday to Friday 8 am - 12 pm ET, Saturday 9 am - 11 pm ET, and Sunday 9 am - 10 pm ET. What does the free credit consultation include? Callers receive a TransUnion summary report, a free FICO score, and the chance to discuss their credit score and credit report with a credit consultant. What happens if I decide to enroll with CreditRepair.com? If a caller chooses to enroll after the free consultation, they are charged a $14.95 fee for their TransUnion, Equifax, and Experian credit report. The other fees are not charged until five days after signing up. There is a setup fee depending on the plan you choose. The Credit Repair Organizations Act (CROA) sets tough laws to ensure company compliance and protect consumer rights. For example, the CROA states that no credit repair organization can bill a customer until services are performed. However, many companies charge a “first work fee” in order to acquire credit reports. A for-profit company must also accurately inform you of what they can and cannot do in addition to providing a written contract and allowing the contract to be canceled within three business days of signing. If you ask, a legitimate company will inform you that you have the right to fix your own credit. Companies that guarantee to erase bad credit or raise your credit score by a high amount very quickly is a red flag. Because CreditRepair.com follows all of these guidelines, they are a trusted credit repair service. Because of the CROA, no credit repair company can legally guarantee the removal of bad credit.